Harlequin ichthyosis is the most serious form of ichthyosis. It affects newborn infant. The infant is covered with plates of thick skin that crack and split apart. Unfortunately, there is no cure for Harlequin ichthyosis. It is essential to consult a doctor. To reduce the symptoms of this disease, it is important to use moisturizing and soothing companion care products. 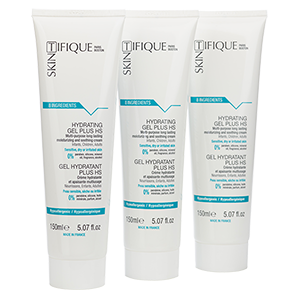 The Hydrating Gel Plus HS can be used as a companion care by people with Harlequin Ichthyosis. This product offers an intense moisturizing and a long-lasting soothing. In addition, it is suitable for infants thanks to its very pure and safe formulation with only 8 ingredients. It does not contain occlusive ingredients, which allows long-term use without side effects.